READY TO FIND STRENGTH & COURAGE IN YOUR HEALTH CHALLENGES? YES! DON'T LET YOUR ILLNESS BOSS YOU AROUND. Take back control and create the life you deserve! Let’s face it, it is hard to imagine what it is like to live in chronic pain, and even harder to figure out the best gifts for someone with chronic pain. This person you want to buy a gift for is probably a loved one or a friend and it kills you that you can’t take some of their pain away. So, finding a gift that they will treasure AND that they really want is your mission. Well, this gift guide is here to help you accomplish that mission! Keep in mind though, that when you live in chronic pain, a gift that helps relieve or cope with the pain is something we really get excited about instead of “cutsy” and frivolous gifts wrapped up in big bows. So, if some of these gift ideas don’t seem like something you would normally expect to be a gift, don’t be surprised. The health costs associated with our illness can empty our pockets fast so to receive a gift that is functional and thoughtful is highly desirable for people living with chronic pain. This gift guide is intended to help you understand what people in chronic pain really want and value. This post contains Amazon and other affiliate links. This just means that at no extra cost to you I receive a small commission if you purchase something through the links in this gift guide. This is one of the ways I support my blog. Read my full disclosure policy. Relax the Back is one of my favorite stores. 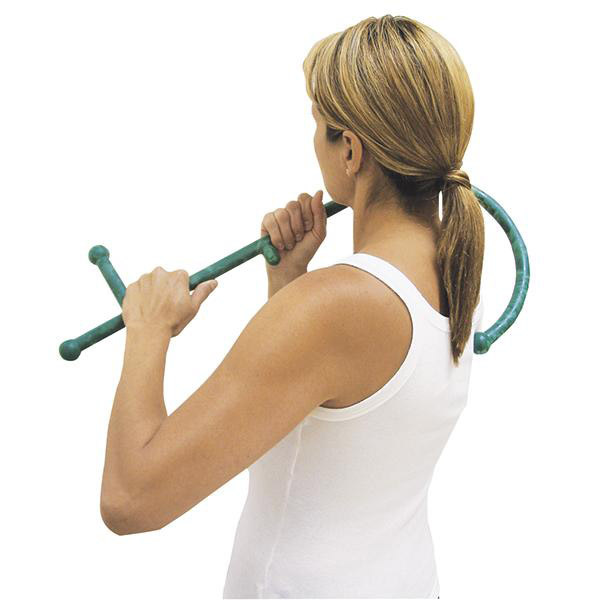 I have had my Theracane for more than 10 years and it is absolutely one of my favorite products to release muscle pain and tension. When you have chronic pain, your muscles react by tensing up. The Theracane allows you to target your pressure points with more pressure than you can apply by yourself. So, having an item that can help release that tension on a moment’s notice and without having to go to a massage therapist every time is a lifesaver. Chronic pain can make it hard to fall asleep. And since most people with chronic pain are on multiple medications, it is amazing to find ways to sleep better naturally. This DoDow is a new product to the market that is an actually a metronome with a light system that helps you fall asleep naturally. I don’t know anyone who would turn away the opportunity to get a foot massage. These washable insoles have 400 nodules that stimulate the pressure points on your feet and strategically place magnets that draw out inflammation and increase circulation. Just imagine, a foot massage when you walk! Yes, please! I wish I would have found this chair so much sooner! With my CRPS (Chronic Regional Pain Syndrome) that mainly affects my lower back, I can only stand or walk for a few minutes before the pain skyrockets. So, this is amazing to have with so many occasions where I can’t find a place to sit down. This is especially helpful when I walk my kids to the bus stop and we have to wait for the bus to come. In one of my Chronic Pain Facebook Groups, I asked, “If money was no object, what pain related product would you love to have?” Multiple people said an Oska. It uses electromagnetic pulse therapy to mitigate pain. Another goodie from Relax the Back is this recliner called The Life Chair. Again, it is one of those “money is no object” kind of gifts, but oh how amazing this would be to have! This may not be in your gift budget, but a gift card to Relax the Back is also a great gift option. This portable bluetooth speaker is waterproof and has 66ft. range capabilities. It also has 24-hour playtime. So, I love to use mine while I am soaking in a bath or while the kids are playing outside. This gift would be great paired with a subscription to Amazon Unlimited Music. There are lots more bluetooth speakers to fit individual needs. Check out my inspirational Warrior Playlist for songs I love to listen to when I feel like my chronic pain is taking over. With all the medications I take, I always have back up medicines I carry with me. Seems like I get less judgmental looks when I pull out this pretty pill box instead of the typical plastic pill containers. There are so many beautiful pill boxes to choose from on Amazon and very inexpensive. Heating pads are a necessity when you experience chronic pain. But most heating pads are plastic, stiff, and rough. This heating pad adds luxury comfort with the same Sunbeam quality I have come to love through the years. But a quick search on Amazon for soft or cozy heating pads reveals lots more choices. I experience a lot of pain, stiffness, and stress in my neck and upper back. This massage block feels heavenly, plus it is made out of super sturdy material that won’t smush and lose its support to exert pressure on your trigger points. Find more gift ideas for someone who lives with a chronic illness. Now that you’ve found this list of gifts for someone with chronic pain, you’ll never be without meaningful and helpful ideas. And although you can’t walk in your loved ones’ shoes with chronic pain, you can make their life a little more comfortable. So, don’t hesitate to spoil them a little! P.S. 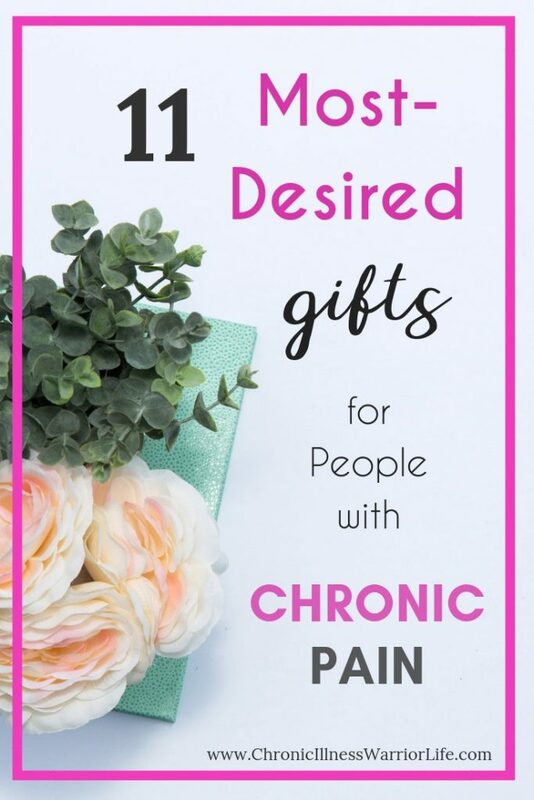 Pin this Gift Guide Full of Gifts for someone with Chronic Pain for later so that you are never at a loss of what to give again! I live with both chronic and mental illness. After years of feeling overwhelmed with my diagnoses, I figured out a way to take back my life. Now, I live a life I love and I want to show you how to do that too! 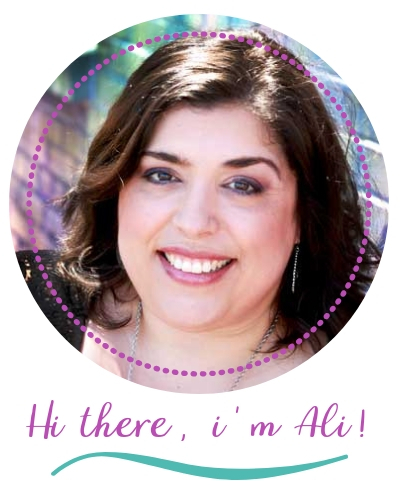 Chronic illness Warrior Life is a participant in the Amazon Services LLC Associates Program, an affiliate advertising program designed to provide a means for sites to earn advertising fees by advertising and linking to amazon.com. This site contains affiliate links. If you click the link and make a purchase (at no cost to you) I may receive a small commission that I use as an income stream for my business. I only ever recommend products or services that I believe provide value for my readers.